The nuns live on simple vegetarian meals. It costs less than US$2 a day to feed, educate and pay for a nun's living expenses, or US$700 per year; a gift of US$60 will provide for a nun for one month. Specific contributions can also be made towards the nuns' medical fund for them to see a doctor and receive medical treatment when they fall ill, offering towards educational costs such as text purchases, teachers expenses, classroom materials, food, etc. For contribution information, please select the respective nunnery's support page you wish to donate to. An important part of a nun's vocation is to conduct prayers and help those in need spiritually and in their daily lives. 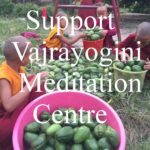 When sponsors send their prayer requests to Sakya nunnery together with their donation, the contribution goes towards supporting the expenses incurred by the nuns. Support the nuns' work by sponsoring prayers and pujas. Online prayer requests to Sakya Nunnery can be made on Sachen Foundation's website. The Sachen Foundation supports monks and nuns, Sakya nunnery is one of the institutions it supports. Go to Sachen Foundation donation page [click here], write in the notes field that the donation is for Sakya nunnery, the specific prayer requested and name of person the prayer is dedicated to, the prayer request will be transmitted to the nunnery for arrangement of the prayer.